Here’s a healthy dish any avocado fan will love. 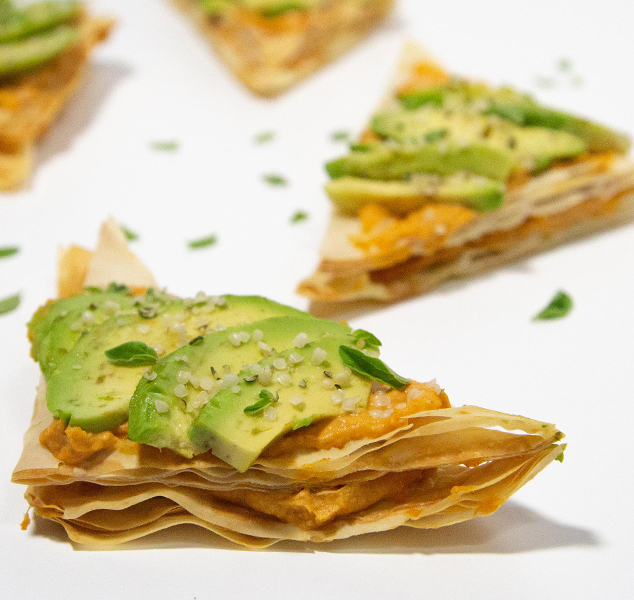 We put a tasty twist on classic avocado toast by using phyllo, avocado, hummus and delicious toppings! Thaw one roll of phyllo, following thawing instructions on package. Preheat oven to 375⁰F. In a small mixing bowl, whisk together egg white, 2 tablespoons olive oil and water. Unroll and cover phyllo sheets with plastic wrap and then a slightly damp towel to prevent drying out. 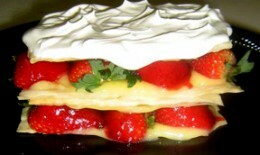 Place one sheet of phyllo on cutting board and lightly brush with egg white mixture. Sprinkle lightly with oregano. Repeat with six more sheets of phyllo to make a stack of seven layers. Do not brush egg mixture on top sheet. Using a pizza cutter, cut the stack in half lengthwise to create 2 rectangles 4 ½” x 9”. Cut each rectangle into 3 rectangles 3” x 4 ½” each. Cut each in half diagonally to create a total of 12 triangles. Place on a baking tray. Brush 1 tablespoon olive oil over the tops of each triangle. Reroll unused phyllo sheets and follow storing instructions on package. Bake for 8-10 minutes or until the phyllo starts to brown. Remove from oven. Carefully spread hummus on each triangle. Place one hummus topped triangle stack onto another. Repeat with remaining triangles so you have six “double decker” triangles. Top each with avocado slices, sprinkle with hemp seeds and serve.